BIG OCEAN, ISLAND, MOUNTAIN and SUNSET VIEWS! 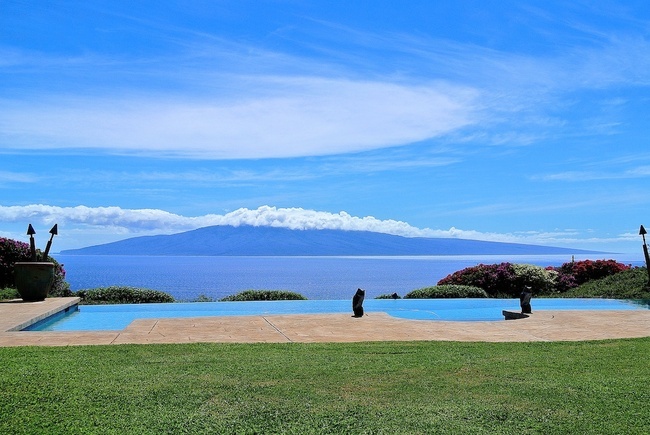 BREATHTAKING, PANORAMIC OCEAN, MULTI-ISLAND, MOUNTAIN and SUNSET VIEWS. Custom 4 bedroom, 4 bath gated EXECUTIVE, single level home built upon the slopes of the West Maui Mountains. Superb interior upgrades of Imperial plaster walls, travertine and wood floors, wood cabinetry and granite counters. Open, spacious interior with Fleetwood pocketing sliders that let the outdoors in. 10 ft. + ceilings, 8 foot doors and oversized bedrooms. The master suite has a generous on suite, open style shower with an additional private outdoor shower. Ocean side luxury infinity edge pool with spa. Privacy, tropical landscaping and gated entry.